Known as hirame when prepared for sushi, the meat of the halibut is firm, dense and sweet. It has a fresh and mild flavor that needs little seasoning, yet offers a high versatility in numerous recipes. It is an easy and delicious option to include more healthy seafood on your menu for your diners to enjoy. Halibut is sweet and lean and with deliciously dense meat. The thick fillets hold up well whether they are baked, grilled, broiled, steamed or sautéed, offering your business a great deal of versatility when preparing a menu. Your chef can explore the halibut’s potential by inventing a tangy marinade or zesty topping to bring out a rich flavor. Sprinkle grilled halibut with fresh mango salsa, or encrust a baked fillet with sweet almonds for a melt-in-your-mouth quality that will leave your diners hungering for more. Pacific halibut are the largest of the flatfish family. They have been known to grow up to eight feet long and weigh over 600 pounds, their huge bodies hugging the sandy bottoms of the coastal North Pacific. Even though they grow to such incredible sizes, it is the “chickens” or 10 pound halibuts that are prized as a delectable catch. Halibut are caught with bottom longlines that have very low bycatch levels and cause little habitat damage. Population assessments are conducted every year to set annual catch limits and distribute a limited number of permits. This management strategy has kept the population healthy and abundant. It has also lengthened the fishing season, ensuring that seafood lovers have access to fresh halibut most of the year! We are proud to boast the blue ecolabel of the Marine Stewardship Council. 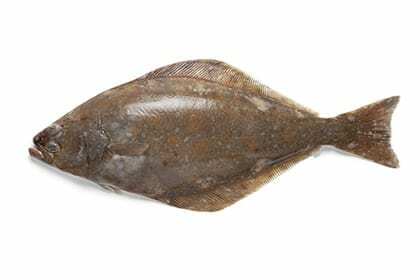 By serving your clients fresh seafood from Pucci Foods, you are helping conserve wild fish populations such as the halibut. We believe in supporting well-managed fisheries that do not harm the environment. Order your sustainable wholesale halibut from us today by completing the form on this page. Our team will be in touch right away.